I came up with this list from pure personal experience. It only touches on a very small amount of things that you learn when entering into true adulthood. I of course did some research on what other people had on their list and some of them were pretty ridiculous, saying you should know how to pair wine to your meal or “dance like and adult”. Truth be told none of that matters until your over 30, if ever. So I hope these tips will help you in some way and always feel free to leave comments with tips of your own. $1 or 2 adds up when your getting a snack at the gas station every day. Think $30/month ($360/yr)! Stay in touch with close family members because they will help you in the middle of the night when you are stranded cause your car broke down or insert situation. Amazon is a friend and an enemy. As a college student you get Amazon prime at a discounted rate. BUT! Take some time before confirming your purchase to plan exactly what you will do with said purchase and decide if it is really worth it, even though you get free shipping. All your textbooks come in ebooks but know yourself and whether you like to underline and highlight things in chapters because it may be better just to order the real thing. Your grade matters more than a couple extra spent bucks. Time Management is one of the hardest things and will probably always be. Be careful about your work schedule and your extra school activities and that you schedule some much-needed time to yourself at least twice a week. It is very easy to think you can take on everything. Say no when you just cannot take on anything else, they will get over it. Learn to cook. But more importantly eat healthy whether you eat out or at the house. You need the energy to go go go and your freshman 15 won’t happen. This does include alcohol. Avoid any student loans. Work and save because you don’t want to be making 40,0000+ a year but most of it go to your school that you aren’t in anymore and it stops you from building your dream home or going on a trip somewhere. Experiences don’t have to cost much. Going to the lake or having a cook out where people pitch in for costs can be just as memorable. If you want to travel, try a study abroad for the summer or mission trip where you can get stuff done and also see the world. Subscribe to the How to Adult page on YouTube. It tells you some good stuff. 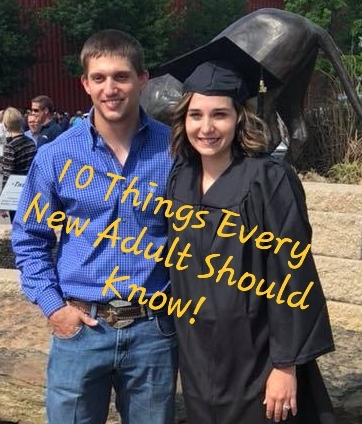 Do not forget to leave a comment below with tips that help you adult better!